This outfit makes me happy, and not just because it’s light and bright. It’s because of where everything came from. The skirt is from a swap I had with my friend Natasha last summer, so it reminds me of her, and the shoes and lipstick were gifts from my friends Ani and Emily on my 30th birthday last September, so they make me think of them and my birthday party. 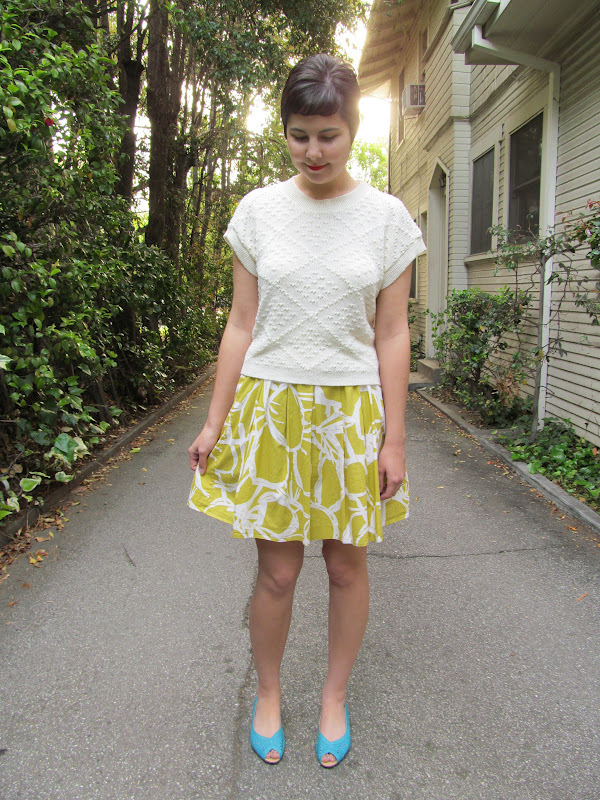 And then I bought the sweater from a new Etsy shop with the sweetest seller. I was her first customer, and she sent me such a nice note and used super cute packaging with a new penny inside the mailer because her shop is named My Lucky Penny Vintage. The weather really was bright and sunshiny today, so my outfit went along with it. It was so beautiful in L.A. and so hard to be inside an office. Whenever I drive to work I dream about just continuing all the way up the coast. I wish I could drive all the way to Vancouver, staying in various locations along the way, including the Olympia area in Washington where a lot of my relatives (who I haven’t seen in years) live. I love those blue shoes so much! The color is fantastic. Especially with your pretty little skirt. This outfit makes me happy too :) I love that skirt and I wouldn't have thought to pair those shoes with this but they work so well! The turquoise shoes work so well with this ensemble...and I'm loving the citrine colour of your skirt. Omg I didn't even recognize the shoes! I love that sweater, I will have to check this seller out!